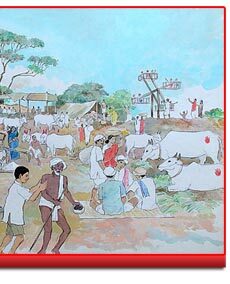 The small boy, Sathya, delighted in placing fresh ash markings on His forehead to the wonder of the peasants and cowherds in the little village of Puttaparthi. He would also take immense pleasure in raiding His sister’s supplies of vermillion to place a round spot on His countenance. From an early age, Sathya demonstrated His message through the way He lived and interacted with those around Him. He kept away from places where livestock, fish or fowl were caught or killed. For His meals, Sathya would run to His neighbour Subamma’s house as she maintained a strict vegetarian kitchen. He rarely retaliated when chided or teased by playmates, and spoke the truth without resorting to the usual childish excuses that a fear-stricken child would offer. 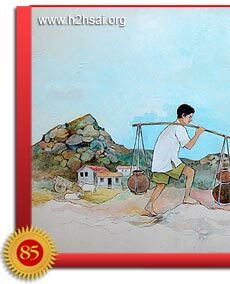 Whenever a beggar appeared at the door, Sathya would leave His play to ply them with food. Even when exasperated family members tried stopping Him from indulging in “an expensive and misplaced charity”, Sathya remained resolute in His example of service. In time, He brought the blind and maimed, as well as the decrepit and the diseased to the front steps of His parents’ house. As His sisters placed rice or grain in the outstretched hands, the Little Master would look on with gladness. Elementary school in Puttaparthi found students terrified of being punished with a cane for being late. Sathya took pity on the students huddled in the cold before sunrise at the school. He scrounged from His own house to bring shirts, towels, and dhotis. The elders at home had to lock away items of clothing that they could not afford to lose. The boys called their friend “Guru” as it was clear to them that He was their teacher. One particular incident that can be cited as a sign of Baba’s divinity was when the boys came across a temple devoted to Hanuman, the monkey God and Lord Rama’s greatest devotee. The boys decided to take a ritual walk or circumambulation around the installed deity to pay Hanuman their obeisance. Sathya did not join them. The boys were chagrined. They needed their leader, so they dragged Sathya along in spite of His protestations. He had barely taken a few steps around the temple when a huge monkey appeared on the scene and blocked their progress; the ritual walk had to be stopped because it could not be shooed away. But in no time, the mysterious primate disappeared as suddenly as it had appeared. Later, Sathya revealed that the monkey was indeed Hanuman, protesting that if any circumambulation were to occur, it had to be Hanuman going around Rama, not the other way around. Such were the hints of Sathya’s divinity that multiplied over time. Sathya had vivid ways of demonstrating the path of dharma. Grandfather Kondamma Raju’s sons and one of his daughters - all lived under the same roof. So, Sathya grew up surrounded by at least 18 children. Those who were clean and straight won peppermints, which Sathya “took out” from empty bags! Once, a tailor was called in to stitch brand new shirts for them all. There were various kinds of coloured cloth. 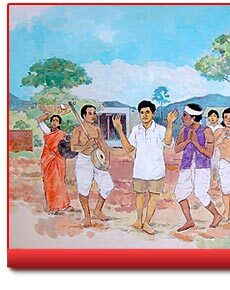 Young Sathya said, “Let everyone be given the cloth he/she selects; whatever remains is good enough for Me.” So saying, the Lord in a young body looked on in joy at the happiness of the others. 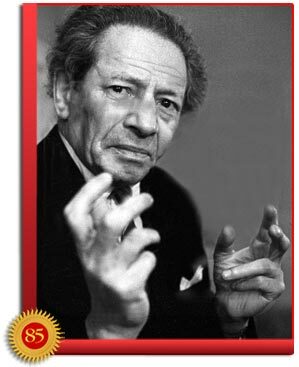 This example of selflessness and equanimity made His grandfather proud. Yet another way that young Baba led His playmates towards God was in the founding of a Pandhari bhajan group. 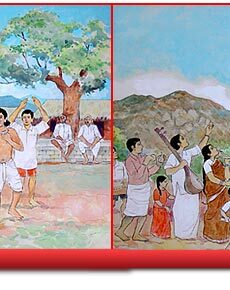 He recruited many of of His friends and got them to dress in matching uniforms and dance to folk melodies describing the yearning for Panduranga’s darshan. An attendant would provide devotional details. Sathya added stories about Krishna and that of an ‘unknown saint’ named Sai Baba of Shirdi. As the organizer, treasurer, composer and lead singer, He brought to life scenes from Krishna’s childhood among the gopis, including the cows, calves, trees and the river Yamuna. His depiction of the Lion-God Narasimha was so fierce, that He frightened the entire village until offerings of camphor and broken coconuts brought Sathya to normalcy again. So popular did the boys’ performance become that they were invited to neighbouring villages nearly 12 miles away. The boys would walk to these villages carrying their food with them. 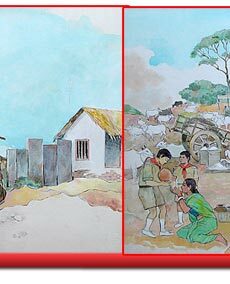 When it was time for Sathya to go to middle school, the nearest such institution was in Bukkapatnam, a village several kilometers north of Puttaparthi. Young Sathya trudged back and forth every day, at times neck-deep in water, carrying His school bag on His head. Making students more God-conscious remained His prime occupation. To hold the attention of His mates, He materialized—out of thin air—candy or savouries for them, much to their amazement. When her children returned from school each day, Mother Easwaramma would make them sit around her and enquire about the happenings in the school that day. 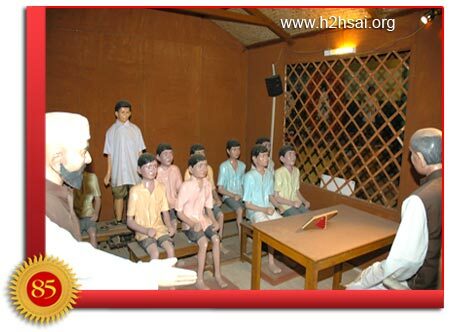 Despite Mehboob Khan’s advice, the teacher Kondappa did not agree with the suggestion. In the meantime, the bell rang signifying the end of this period. The teacher tried to get up from his chair so that he may go to another class. But, he could not get up. He looked around to see whether his dhoti had got stuck to some nail. It was not so. What had happened was that he himself had got stuck to that chair and hence could not get up. 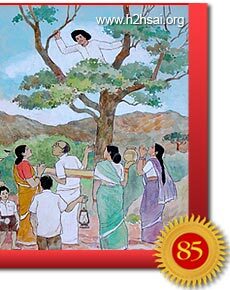 Baba has disclosed that this drama of the teacher getting stuck to his chair was not staged to humiliate the teacher concerned, but to make people conscious of the divine powers that Sathya was born with. Around this time, Swami’s older brother, Seshama Raju, moved to Kamalapur to train as a teacher at the school there. As it was a good school, Seshama Raju wanted to enroll his younger brother there as well. After all, the whole family had pinned their hopes on Sathya to make it to college and distinguish the family by becoming an officer with the government. So, Sathya moved to Kamalapur and moved in with Seshama Raju who was residing with his in-laws. It was here that Sathya performed arduous household duties such as fetch drinking water for the family everyday from a far-off well. In keeping with His teachings on forbearance and equanimity, He performed His chores diligently, despite the scars they left on Swami that remain to this day. Once again, Sathya was a favourite among the teachers and students alike. His drillmaster, who was also His scoutmaster, insisted the boys attend and render service at the General Fair and Cattle show in neighbouring Pushpagiri. A fee of 10 rupees was collected from each boy for the bus trip and other expenses. Sathya could not afford such an indulgence. Excusing Himself from the group, He nevertheless assured His scoutmaster that He would somehow get there in time for duty. So, while His friends reached the fairgrounds by bus, little Sathya walked the entire distance on foot. When He got to Pushpagiri, He carried out His duties unmindful of the tiredness from the long journey. He even picked up gifts for His family in Kamalapur. When He returned, what greeted Him was not appreciation for the gifts, but a severe punishment as His absence had interfered with the family’s supply of drinking water! Swami has revealed to us that He deliberately created such painful situations for Himself to teach humanity the qualities of forbearance and equanimity. One day, Sathya and a few other students were taking their customary walk by the railroad station when they stopped to sit on a bench. A white-skinned foreigner saw Sathya through the window of the train approaching the station and tried to get off from the carriage before it could come to a halt. In the bargain, the fellow fell off from the coach. Sathya’s fellow students, Ramesh and Suresh, grew anxious that the foreigner would have broken his leg.